Maybe it’s a yelp that she just started doing. Or constant purrs. Or even the classic “Meow.” Cats make a lot of noise! It’s one of the reasons we love them. But have you ever wondered what those noises your cat makes actually mean? Sadly, outside of Pixar movies no one has invented a pet translator quite yet. When you work around pets frequently, though, you do begin to understand a little more about they’re trying to tell you. Body language serves as the primary communication method between humans and other species. Often animals will make noises that identify how they are feeling. Cats in particular have a wide variety of sounds that they make. If you have ever interacted with multiple cats at one time, you may have noticed how they spend a lot of time and energy communicating with other cats. They hide, poke out from behind objects, pounce, and leap up to avoid bodily contact. Although they often avoid body contact, they will try their hardest to maintain eye contact. Many owners have difficulty picking up on a cat’s subtle body language, such as ear movements, eye twitches or tail quivers. Therefore, understanding the meaning of cat noises is important in realizing how they are feeling and what they want. Here is a list of some of the more common sounds you’ll hear your cat make! This is the sound that everyone is familiar with! Kittens will meow more than adults, especially because they are born unable to see and hear. This noise is used to alert their mother (or owner) when they need attention. Purring is a sign that all cat owners love to hear. It is typically made when your cat is in a state of pure contentment, such as sitting on your lap while being pet. There is a small footnote to this, though – if the cat’s ears are flat against their body and their muscles are tensed, while purring, that’s a sign that they’re nervous about something in the environment. A combination of the meow and the purr can be used as a friendly greeting! This can be used when afraid or angry, and typically comes after a growl. A cat will typically use this as a final warning before a serious fight begins. If your cat is making this vocalization, be very careful of their surroundings – something is likely putting your animal in danger! 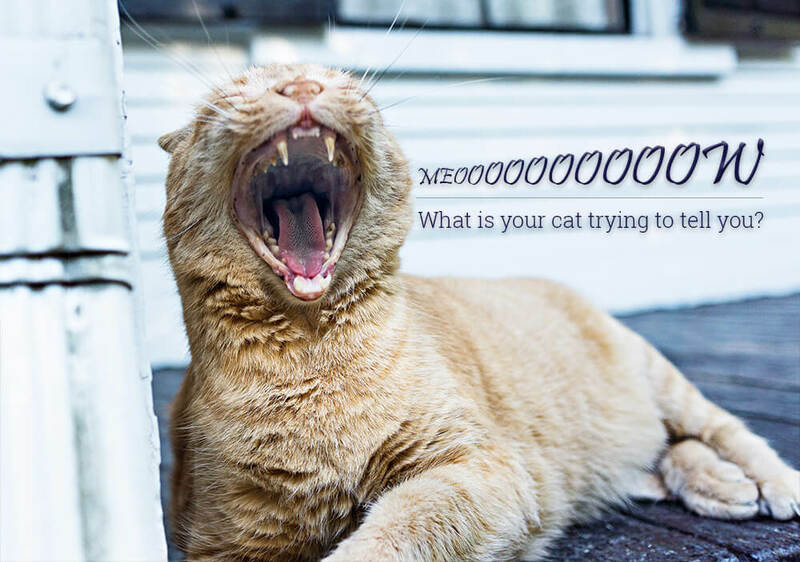 If your cat seems aggressive or constantly hissing & yowling, there may be an internal problem with the cat that only vets can figure out. Bring your cat in today for a checkup or examination to ensure they’re not in any pain or enduring health dangers. On the other hand, if your cat is meowing all the time, be content with knowing how much they love announcing their fondness for you!